2017 – No tour this year of BC and Alberta … I have work obligations and need to focus on learning new content so that I can teach it in the Fall. I highly recommend that you watch Steven Greer’s new documentary Unacknowledged and find someone on the http://www.etContactNetwork.com website. In my area the number of people list has gone up about 10 times in the last five years. July -Aug 2016 … if sufficient interest I will go anywhere in BC, Alberta & Sask. 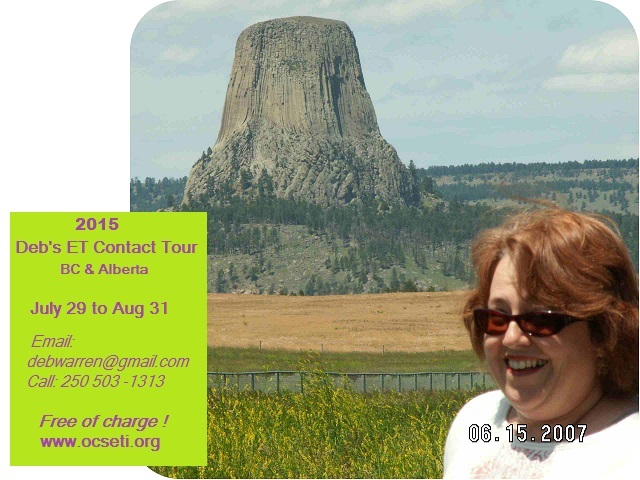 July-Aug 2014 … if sufficient interest I will go as far as Saskatchewan. Book your dates now! I will be in Calgary July 26th weekend. Are you in Canada? British Columbia or Alberta? Can you organize and event in your community? If so then call me at 250 503-1313. If not then join http://www.ETLetsTalk.org (membership is free)…find the community map and see if there are people near you who will do the contact protocols with you. I would like to meet with one of your groups in the Fraser valley or Vancouver. I have had a couple of experiences and would like to discuss them with some knowledgeable persons. Also, learn the protocols. Sorry for the delay in responding, got back Monday from ET Contact in Alberta (3 groups), last night in Osoyoos, Vernon on Saturday (Aug 10th), Penticton on Sun (Aug 11th)….then next week, Maple Ridge, Victoria and Vancouver. Are you able to host a group for Sunday Aug 18th. Lots of individuals are requesting but only a few are willing to host an event. I will email you a sample agenda from my personal email. 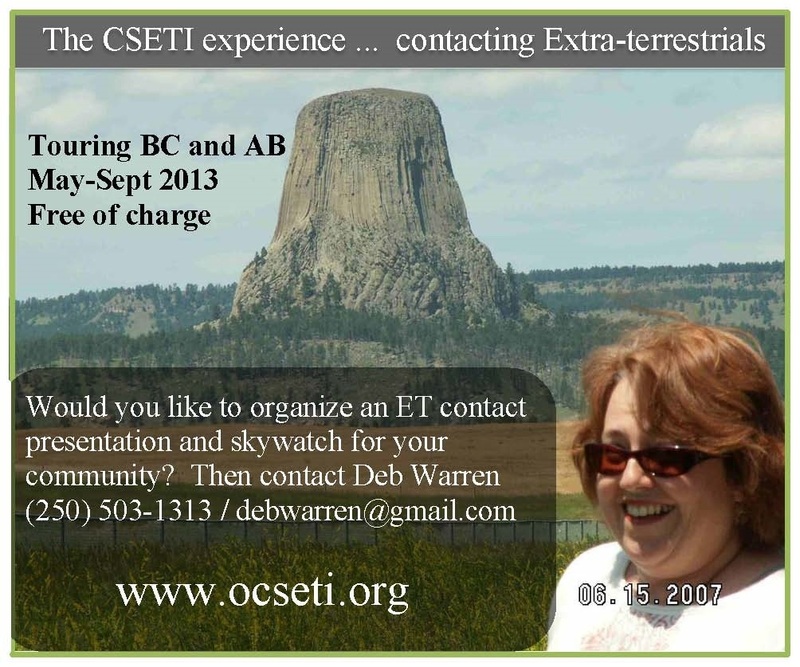 Sorry that i missed your post I was too busy doing ET Contact in Alberta. Most of the people who hosted a Vancouver event, invited only their friends. I will contact you next year when I do another tour. Try Contacting Terry Tibando terrytibando@gmail.com He lives in Port Coquitlam. There has been a great increase of interest in CSETI and the movie documentary Sirius in the last month from new people contacting me to know more about it and to become involve in the CSETI Vancouver team. 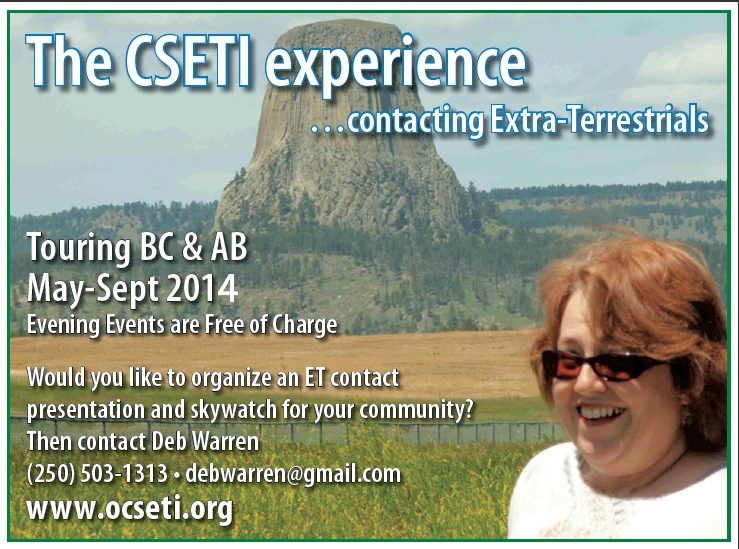 This is awesome news for our CSETI group and for public awareness of the ETI presence visiting the Earth! Because of this interest on Saturday August 24th at 2:00 PM, I will be holding an orientation presntation on the CSETI CE-5 Initiative, its history, protocols, modalities of communication, meditation, remote viewing (RV), coherent thought sequencing (CTS) leading to open contact with Extraterrestrial Intelligences. This is mini seminar is not only for the newcomers to our group but also to ensure that the older members are all on the same page when we are out in the field establishing contact with ETs. We will have dinner together around 5;30 PM (let me know if you want to do potluck with everyone bringing something for about a 12 people or if you want to order pizza and salads, locally), followed by a viewing of the movie Sirius and then, a field trip to Coquitlam River Park with setup by no later than 8;30 PM. If the weather is overcast we will still do the event and if it rains heavy, we will do the event indoors. As always, an early reply is required to plan and coordinate this event. If you are coming from downtown Vancouver, give yourself and hour to get here. You may also bring a friend if you like, the more, the merrier! Did you find ETletsTalk.org? Membership is free to read reports and look up people on the community map. You will need to pay if you $64 if you want to submit reports. My name is Steven Walter, I have been working with the CE-5 protocals for just over two years now and the study has opened my eyes and heart to the truth. What started as a sideline curiosity into Astral projection and remote viewing lead me to resources of Steven Greers. His ‘Crossing point of light’ workshop proposed some vivid changes to the way I was observing reality…so after a couple months watching content from Dr Greer I decided to download the contact app and give it a try in my own back yard with an open mind but an unsure heart. As I finished my first guided meditation I sat off the balcony behind the house I was renting and watched the sky. A red flash pulled my attention West. A red Satilite appeared moving South to North and as I watched it it stopped moving and just hung there. It droped linearly down a small bit then continued forward for a while before stopping and sitting there as a light and repeting this ‘Stop, drop, go’ patters all the way North towards the Nass Valley and out of sight. Its nothing spectacular but it was anomalous from anything I had seen before. So I continued my efforts out of curiosity and for two clear nights afterwards nothing of notice happened. I ended up moving from that location and purchanced a property 20km outside of town and began more CE-5 efforts on the roof of my home still using the app and tones. The first night I got to witness flashbulbs, exquisite! White rings of light going in lines and circular patterns. Many multidirectional comets going in all directions of various speed crossing over my home. A few weeks after low airspace craft started to appear in flyby over my house. Three seperate occasions each a different color and in order of appearance Red, Yellow and Green. So much more has happened but I would be typing for a long time. I live in Western Canada, Terrace B.C.